With both players keeping things very close to the vest, you knew they'd both need to pick up big hands before anything decisive took place. And that's exactly what happened on the last hand of this Pot-Limit event. Jason Newburger was dealt and he raised the pot, and Greg Hopkins looked down at the . He reraised, and although he'd made some big laydowns earlier in the day Newburger wasn't about to give up his hand now. He moved all in for the last of his chips and Hopkins called. The gave Newburger a gutshot draw and two additional outs. The didn't help, and needing paint on the last card, the arrived on the river to give the pot to Hopkins. The chip counts were so close that it wasn't immediately clear the match was over, but Hopkins seemed to know as he raced over and hugged some supporters in the audience who just watched him win his first bracelet. Jason Newburger turned the tide of the match over the last hour or so, but after fighting back from next-to-nothing, he had to settle for being our runner-up and $165,707 in prize money. 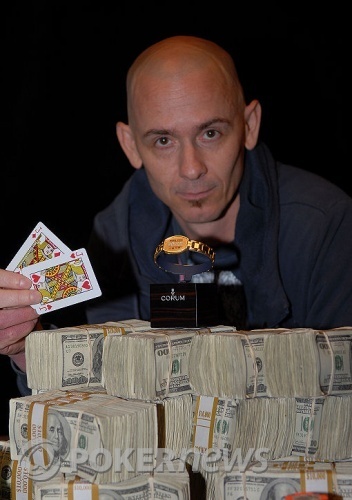 And in addition to the coveted World Series of Poker bracelet, Greg Hopkins won $269,707. Forgive the lack of updates the last half-hour or so, but there's been precious little to update about. Neither player seems willing to raise before the flop, or bet after. We've seen a number of hands checked down, even after one player made a pair on the flop. And so far the cards have trended Newburger's way. When he picked up a pair of kings to Hopkins' Q-10 and Hopkins made a rare play at the pot after a flop. Newberger came over the top with an all-in bet, and after giving the situation considerable thought (despite having no hand or draw), Hopkins mucked. And in most-unlikely fashion. Facing a raise, Newburger tried to make a move with and Hopkins called with . With his flush outs removed from the equation, Newburger's best hope was to hit a pair...and that's just what he did on the flop. Hopkins picked up some additional outs when the turned, but he didn't get the picture card he needed on the river. Newhouse has now closed the gap to 1.6 million to 800,000. Neither player seems willing to show any aggression. Hopkins has the chip lead, yet he isn't using those chips to put Newburger to the test and really beat him down. The players seem content to limp into pots and check them down, and so far Newburger is getting slightly the better of that, increasing his stack to around 400K. Jason Newburger went with his read...and it nearly cost him the tournament. Holding Newburger flopped a pair on the board, but Hopkins flopped top pair with . Hopkins bet the pot, and after thinking about it Newburger called. The fell on the turn and again Hopkins bet the pot. Again Newburger thought a long time before just calling. That left him with only about 275,000 behind and when the fell on the river Hopkins moved all in. With just bottom pair, Newburger thought for several minutes about what he should do. That also filled every possible draw on the board, but there was so much money in the pot that Newburger seemed unwilling to surrender his hand. It took him several minutes of stacking and re-stacking his chips before he conceded defeat and mucked his cards, giving Hopkins a massive chip lead. Both Hopkins and Newburger are playing EXTREMELY cautiously in the early stages of their heads-up battle. Lots of limping, lots of checking, very little betting.